Somebody please let me in! In a home where climate control is not a full-time necessity, a screen door for the resident canine is a handy thing. You get fresh air and your dog gets to come and go without your services as doorman. A screen curtain "as seen on TV" provides instant access for both you and your dog. These fine mesh draperies cover a doorway with two panels that snap together at a magnetic catch in the middle after you pass through. Unless you own an Irish wolfhound or other tall breed, chances are your dog won’t even pull the magnets apart as he noses through the split. Weights sewn into the bottom edge hold it down and pull it back into place (as long as it's not blowing a gale), and the netting keeps out insects, but not dust. The whole assembly either hangs on a tension rod wedged inside the door frame or attaches to hook-and-loop patches stuck to it. Installation is almost instant. For sliding patio door screens, you can install a dog-size screen door within the people screen. These have a swinging flap that operates in both directions and can be clipped into the screen mesh almost anywhere, but the most stable type, recommended for big dogs, attaches to both the side and the bottom of the door frame for added strength and stability. Installation seldom requires more than a pair of scissors to cut the screen, but do this carefully, as mistakes can cause you to have to replace the entire door screen. A dog screen door in the bottom of a storm door that has a solid lower panel allows you to give your dog access to the outside while the main door is open, but restrict it by closing the main door. Install a self-framing dog door of the appropriate thickness for your storm door. 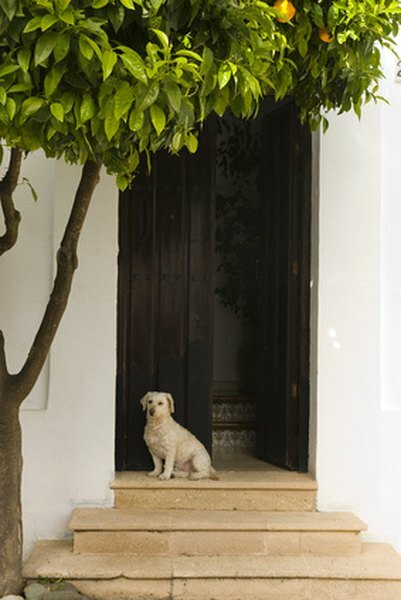 If you're not into do-it-yourself projects, you can buy a storm door with a built-in dog door. If your big dog can get through a pet door, so can a small human. Choose a pet screen door that you can close and latch on the inside. Get the smallest size your big dog can get through. Pet doors are not selective, so you may find the neighbor's pets or a hungry raccoon using yours. Consider creating an "air lock" by placing your pet screen door leading into a mud room or other room with a securable door to the rest of the house. That way, your pet can come in out of the weather while unwanted visitors are kept out of your inner sanctum. What Does it Mean When Your Dog Whines? What Is a Dog Slicker For? Do Cats Sleep a Lot After Spaying Surgery?